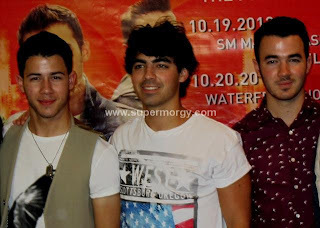 ‘Jonas Brothers’ (as collective noun) (composed of Nick, Kevin and Joe) is the first international act that I get to officially cover. I was thrilled when I got the invitation to be in their Presscon at the Makati Shangrila. I fell in love with Nick right away when he came out of the holding room. I was like a teenager smiling at him and being giddy. Haha! He was very smart and I love the way he answers questions from the Press. So masculine, kinda serious but was so in the game. 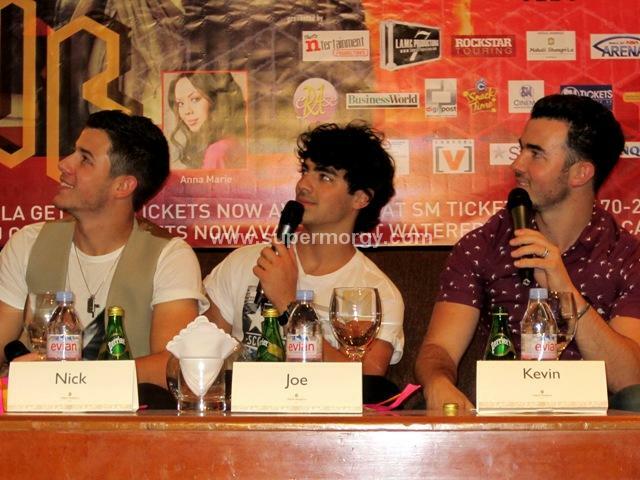 Kevin on the otherhand, was funny and relax while Joe was playful & charming. The boys will be performing together for the first time in three years at the SM Mall of Asia Arena tonight, October 19 and tomorrow October 20 at the Waterfront Hotel in Cebu. This was made possible by That’s Ntertainment Productions. Here are some tidbits for you guys from the Presscon. 1) They will try halo-halo (as what they called different ice creams). 2) Dream collaboration is with Jessie J or Adele. 3) They said that the Jeepneys in the Philippines are awesome. 4) The food in Manila is great. 5) They have a 30-min-closed-door preparation before they perform. For those of you who don’t know; Jonas Brothers have taken over the hearts and bedroom walls of teenage girls everywhere since their 2007 debut. The trio came up with albums offering sets of catchy pop tunes-- including their 2007 single from the movie Meet the Robinsons titled "Kids of the Future" which was based from the song “Kids in America” of English pop singer Kim Wilde. 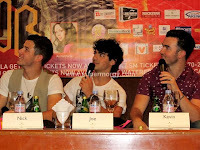 JoBros,’ as their million fans fondly call them, also released their original pop radio hits like “Hold On”, as the band's first single from their self-titled second album in 2007. The iTunes Store named this single as #3 on their "Best of the Store" Playlist in 2007. Another hit song "SOS" rose to #17 on the Billboard Hot 100 and became the band's first single to reach the Top 20. 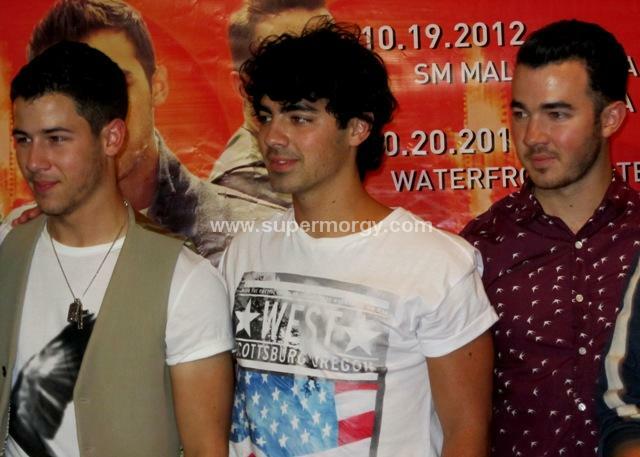 The song "When You Look Me in the Eyes" also consolidated their success and becoming the group’s power ballad. While “Burning Up” cemented the brothers as one of the hottest commodities in the pop music when this single became a hit via digital downloads and the group's first top five single in the US and highest charting song to date. Disney Channel’s Jonas Brothers: Living the Dream (2008) also featured these brothers as the reality series follows them on their first nationwide tour, giving fans a glimpse of how the guys prepare for concerts-- as their life of rockstars. They also headed the big screen in 2008’s Disney Channel Original Movie titled Camp Rock which they starred with Disney’s pop star Demi Lovato and followed up a sequel in 2010’s Camp Rock 2: The Final Jam. Currently, Nick, Joe and Kevin are enjoying successful careers individually since leaving their days being the most culturally important American rock bands of the last decade. Joe launched his solo career and is now a judge on the new CW music competition The Next. He was also one of the bachelors looking for love on Fox celebrity dating show The Choice. Kevin and his wife Danielle are starring in the Reality series Married to Jonas. Nick, the youngest among the three, stepped into the shoes of J. Pierrepont Finch in Broadway’s How To Succeed In Business Without Really Trying. 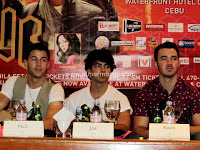 The band has released four-bouncy, breezy pop-rock album albums have sold over eight million copies worldwide in the albums It's About Time, Jonas Brothers, A Little Bit Longer, and Lines, Vines and Trying Times. In 2008, the group was nominated for the Best New Artist award at the 51st Grammy Awards, won the award for Breakthrough Artist at the American Music Awards. 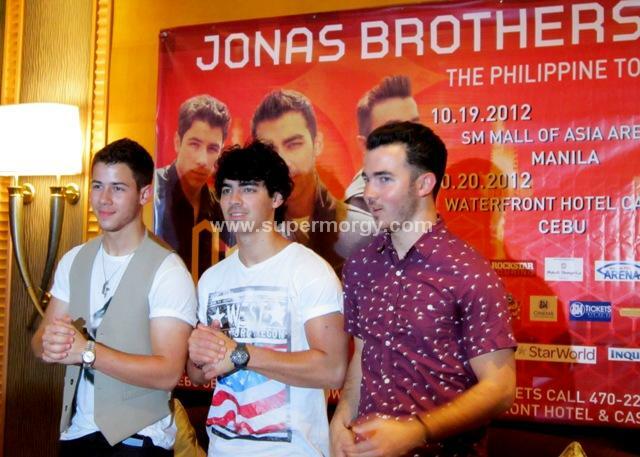 For Manila ticket reservation, you may call SM Tickets at 470 2222 or reserve online at https://smtickets.com/. For Cebu tickets, you may call (63)917-7037663 or(032)3181734. Here are the photos I took during the Presscon with an exclusive video! Enjoy!